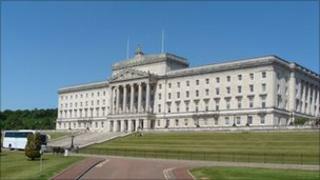 There is growing speculation that the Northern Ireland Executive is on the brink of agreeing a draft budget. Ministers were summoned to a session of the Stormont budgetary review on Tuesday followed by a full Executive meeting, which is ongoing. Minister for Regional Development, Conor Murphy, said he is "very hopeful" that the Stormont parties are close to finalising a draft proposal. He added: "But there are a few hours to go yet." Mr Murphy said he expected the First Minister Peter Robinson and the Deputy First Minister Martin McGuinness to outline their proposals at the budget review group meeting, before presenting them to all of the Executive ministers. The Minister added: "The First and Deputy First Minister will want to speak to the Minister for Finance and other ministers on the budget review group. "I expect an executive meeting will be called tonight and I sincerely hope that that will lead us to agree a budget." BBC Political Editor Mark Devenport said the draft is certain to include cuts for some departments as well as proposals for generating extra revenue, such as a charge on civil service car parking and a plastic bag levy. A public sector pay freeze for those paid more than £21,000 is also likely. There is speculation the Harbour Commissioners and Housing Association will be asked to contribute money from their cash reserves. Conor Murphy admitted the draft budget also includes "revenue raising options". If an agreement is reached on Tuesday night the draft budget could be presented to the Assembly on Wednesday, before going ahead for public consultation. Mr Murphy insisted the final agreement is a matter for the entire Executive and all of the coalition parties must be onboard. He added: "Of course people will have an opportunity to go over the budget line by line. There is a period of consultation, this is not a finalised document." Environment Minister Edwin Poots said he is confident the budget will be passed soon. He added: "This is a four year budget as opposed to a one year budget that Scotland done. "So when it is concluded it will give people some certainty not just for a one year period but for the lifetime of the next Assembly." Northern Ireland is the last devolved administration to agree on a budget. Chancellor George Osbourne ordered Stormont to cut spending by £4bn over the next four years as part of the Spending Review announcement on 20 October. However, the five-party coalition has yet to agree on how the savings will be made. Scotland and Wales have already outlined their spending plans. There have been concerns expressed by ministers about at the length of time it has taken to finalise a proposal. The First Minister Peter Robinson said that a budget had to be agreed on before Christmas. However, Sinn Fein had warned it would not be rushed in to making a decision.